Music is everywhere in the world around us; it is part of all of our lives, whether we play it, actively listen to it, or hear it in passing. At Oxford, we study music by reading, listening, performing and composing. We create music in all its aspects – acoustic, electronic, individually and communally, working with world-class professionals and with local communities. We investigate, through analysis, the relationships within a piece of music, and between that piece and its genre and context. Throughout the course, you will be exposed to music of all kinds and in all contexts: Western classical, popular music, musics of other cultures, community music, seeing these musics in terms of their history (and how that history has been shaped over time), social context, and psychology. Music has been part of the life of Oxford for more than 800 years. There are around 30 academic staff, of whom 15 give lectures regularly – scholars with distinguished reputations as musicologists, performers or composers. Oxford welcomes visits from numerous speakers and professional performing ensembles. 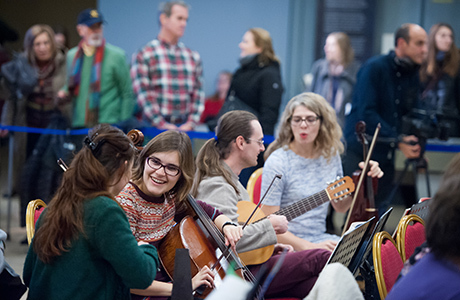 Students enjoy performance and composition workshops, and play an active part in the life of the faculty and their colleges – in chapels, orchestras, ensembles, bands and stage performances, and in musical outreach to the broader community. The faculty building incorporates practice rooms, electronic music and recording studios, and one of the best music libraries in any British university. The world-famous Bate Collection of Musical Instruments, housed in the faculty, lends historical instruments to students. The faculty also has a gamelan orchestra. The course is broadly based but allows increasing specialisation and choice as you proceed. Whether you’re a performer, a composer, a budding scholar of psychology, history, sociology or education, the Music course offers something for you. Students graduate as mature and well-rounded musicians with an informed and lively sense of the contemporary study and practice of the subject, and the ways in which music contributes to society more broadly. Tutorials are usually 2-4 students and a tutor. Lecture sizes may vary depending on the options you choose. Compulsory lectures are the largest and will include the full year group of around 70 students, while the smallest lectures, for specialist options, might include fewer than 10 students. Seminars will also usually involve 10-12 students. Most lectures are delivered by Associate Professors and Professors within the University. Most of these professors are also college subject tutors (although not all college tutors are University lecturers). Each college’s subject tutor is responsible for giving and coordinating tutorials. Many tutors are world-leading experts with years of experience in teaching and research. Some teaching (mostly at tutorial level) may also be delivered by postgraduate students, who are usually studying at doctoral level. To find out more about how our teaching year is structured, visit our Academic Year page. Please note that the courses listed above are illustrative and may change. A full list of current options is available on the Music website. Recommended: Keyboard ability of ABRSM Grade V or above is also highly recommended. * If your school does not offer A-level Music: A-level Music Technology and Grade 7 or above Music Theory (ABRSM), plus two other A-Level subjects. If your school does not offer A-level Music or A-level Music Technology: Grade 7 or above Music Theory (ABRSM), plus three A-Level subjects. 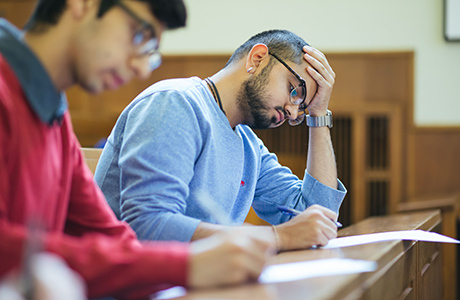 If your school does not offer A-levels, you will need to take equivalent qualifications (including in Music); the University Admissions pages specify the standard you will need to attain. If you are unsure about your qualifications please contact academic.admin@music.ox.ac.uk. There is no written test, but candidates who are invited to interview in Oxford will be asked to give a performance of a prepared piece on the candidate’s principal instrument or voice (organists, percussionists and candidates requiring an accompanist should inform the faculty in advance of the interview period). Candidates not possessing keyboard fluency to ABRSM Grade V may be asked to take a standardised keyboard sight-reading test at interview. Please indicate your level of keyboard proficiency on your UCAS application. Some tutors may ask you to study a short piece of music and/or text about music in preparation for your interview; if so, this material will be given to you during your stay in Oxford. Description: Two teacher-marked essays (at least one of which should normally be on music) and one or two examples of teacher-marked harmony and counterpoint (eg Baroque chorale, 16th-century counterpoint, 2-part invention, string quartet, Romantic songs). If you wish, you may also submit one or two short examples of original composition, which should be in some form of notated score. Please note, the emphasis in on quality of thought, not on quantity, so each of the two essays should be around 1500 words. If you send physical copies, please print on only one side of the paper. Potential to engage with the course in its full diversity through a genuine spirit of enquiry; keenness to think critically about music; as well as creativity and independent thought in areas of specialism (musicology, composition, performance, ethnomusicology, psychology of music, musical analysis). For more detail on the selection criteria for this course, please see the Music website. The varied nature of the course enables students to develop highly desirable skills in areas such as self-management, creativity, data analysis, performance, teamwork, problem-solving, and communication, all of which makes them an attractive prospect for potential employers. Teaching, performance and arts administration are among the popular destinations for Music graduates, but others include broadcasting, publishing, law, politics and the Civil Service. Many students undertake further study in performance, often at conservatoires in the UK and abroad. Rather than limiting your career prospects, a music degree opens doors to a wide range of careers both within and outside the arts. Students may choose to have instrumental or voice tuition as part of their course, though please note that performance is not compulsory. 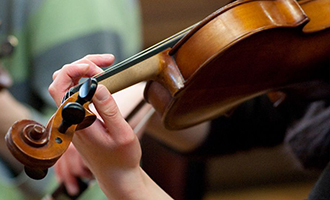 With advice from your tutors, you can choose your own instrumental tutors. You will need to pay for these lessons yourself, but the money will be refunded by the Music Faculty at the end of term, up to £275. This usually covers the full cost of tuition. Students can also apply to take part in a Faculty-funded scheme with the Royal Academy of Music, which provides 8 hourly lessons and participation in master-classes and performance classes at the RAM. Why not have a look at the faculty's recommended reading list for prospective students.